Every year we — The Storytellersusa.com — donate portrait photography gift certificates to about 30 charitable organizations for their silent/live auctions. It’s our way of giving back and being introduced to new potential clients—a definite win-win! One of those charitable events last year was the Idaho Humane Society’s 25th Annual Lawn Party. In that event we donated to their silent auction and their live auction. The live auction was a chance for bidders to have their pets photographed for the cover of Paw Prints Magazine—a very popular live auction item that regularly goes for thousands of dollars! 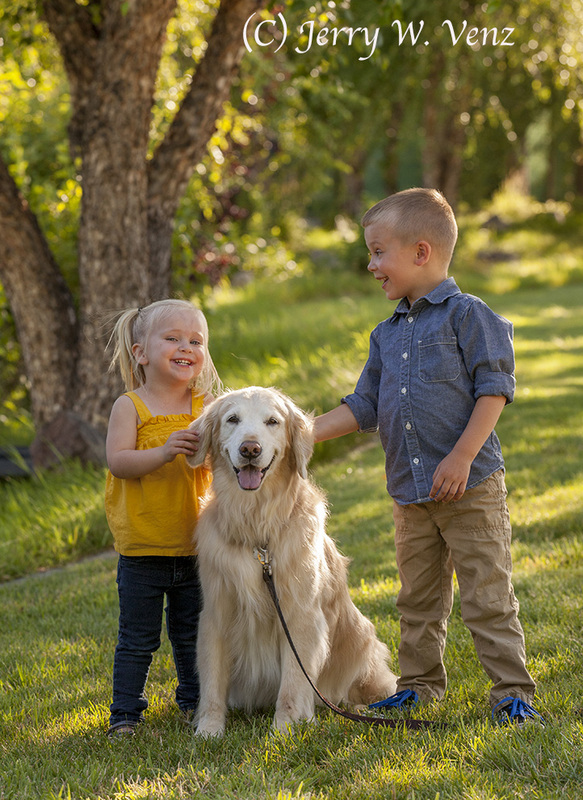 It turned out that I had no need to worry—their dog was a joy to work with and the kids had a great time too. 1) ISO is a professional’s tool to get the shutter speed and f-stop we require. Of course you need a pro-grade camera that has very low noise to use the ISO’s I like; my starting point in outdoor photography is ISO 400 then 800 and when needed I go to 1000 or 1600. 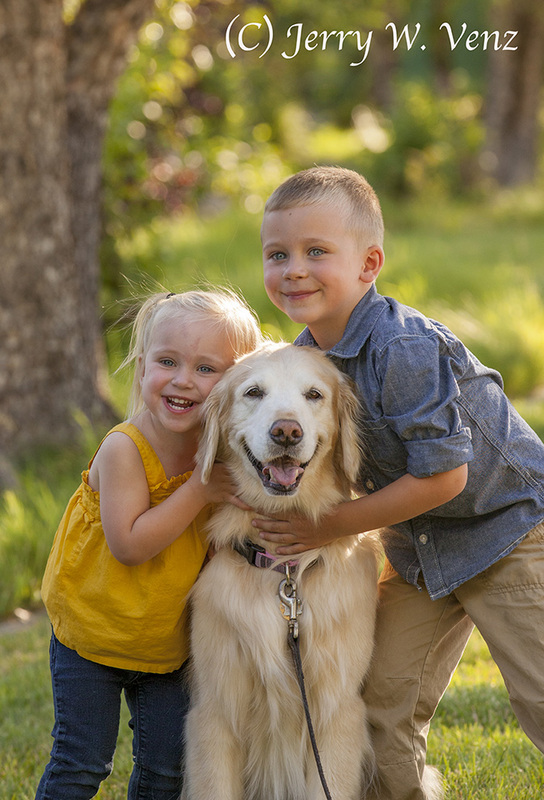 2) ISO 800 in this environment enabled me to bring my shutter speed to 1/250 sec., which is about the slowest shutter speed I’ll use when doing action of kids—and kids with a dog are always in action! 3) The aperture I wanted— f6.3 — gave me enough depth of field in case the kids moved out of alignment. 4) And Lastly, by using my zoom lens at 200 mm the background still went nicely out of focus even at the relatively small aperture I was using to get the good depth-of-field. We also did the usual individual portrait of the dog, but we talked-up my idea for the cover with the editor and he said he would consider my idea when he saw what we had created. We’ll see what he picks soon, but either way I’m very happy with the results; I captured the vision I had in my head—the ultimate goal in professional photography! MAKING CHILDREN’S PORTRAITS FUN FOR THEM!